On arrival the host farmer meets the teachers and pupils and directs them to a building set aside for safe storage of coats, shoes, lunch boxes etc. At this point the pupils have a short safety briefing to make sure they understand that if they do as they are told there is no danger and the day on the farm will be fun, exciting and something completely different from a normal school day – but they will still be learning! Then, depending on what lesson the class is doing they make their way to the appropriate part of the farm. This might be the cattle housing, farm pond, wood, the cheese dairy, milking parlour or the fields. Organised activity is the order of the day before lunch studying various aspects of the chosen topic. It might be habitats where the pupils are encouraged to explore the surroundings and see what they can find living in unusual places or it might be watching the cows being milked before visiting the dairy to see cheese being made. Lunchtime is taken up eating ….. and playing. Most farms have areas designated for children to run around in. It might be a field or it might be a wood. Play is supervised – the same as at school – again in a safe but different environment. Afternoon study either expands upon the mornings work or it could be a trailer ride studying growing crops or the local village. If the class is mapping the site then this would be the time when the day’s work is joined together to make a huge map of the farm. Whatever topics are studied, the visiting class can be assured of an action packed day with lessons linked to the National Curriculum delivered in a safe and innovative way. Resources taken back to school are fantastic and can be used for numerous projects and applications. Lesson plans available are a guide to what can be done on a farm and can be adapted to suit a specific subject. Nothing is set in stone …. 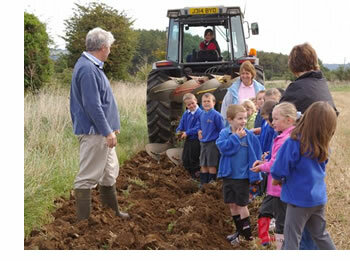 try visiting a FarmLink farm and join a growing band of people using ‘A Classroom in the Countryside’. BOOK your visit to a FarmLink farm today!